A major funding announcement in NIverville on Friday morning has paved the way for the town's long-awaited community resource centre. A multi-million dollar multi-purpose community centre is coming to the town of Niverville and is expected to be up and running in the fall of 2020. 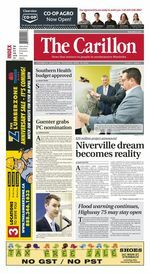 On Friday federal, provincial and municipal leaders gathered in Niverville to announce that thanks to a federal contribution of $7.8 million and a provincial contribution of $3.5 million, construction will soon begin on the Niverville Community Resource Centre. The town will also contribute up to $8.2 million to the project, bringing the total cost of the centre to approximately $19.5 million. Construction of the approximately 100,000 sq.-ft centre will begin in six weeks next to the town’s new high school currently under construction near Arena Road. The centre will consist of a performing arts centre, a not-for-profit community childcare centre, a field house, leisure activity spaces, an indoor play area, an arena, meeting rooms and a community commons area. Federal Minister of International Trade Diversification Jim Carr said the project received federal funding because he and other believe it has "all the ingredients for success." "It has community support, it’s a way to allow the community to gather in healthy ways, it’s a place where kids can forge relationships that will probably last a lifetime, and it shows how governments can work together when communities say ‘this is what we need,’ so everybody wins." "It’s going to be a jewel for our community," Mayor Myron Dyck said "It’s going to be a place where the community can come together and we are looking forward to working with the school division to find ways that the school can utilize this as much as possible." Dyck said the facility will now have a space large enough to host large events like Remembrance Day and graduation ceremonies, and also have a space where parents can take young children to play. Steinbach MLA Kelvin Goertzen added that the project represents "Manitoba’s first community campus model and will leverage use of shared spaces to integrate culture, recreation and community."